Peter Saunders, chief executive of the UK charity the National Association for People Abused in Childhood (NAPAC), has been named to the Vatican’s commission for the Protection of Minors. 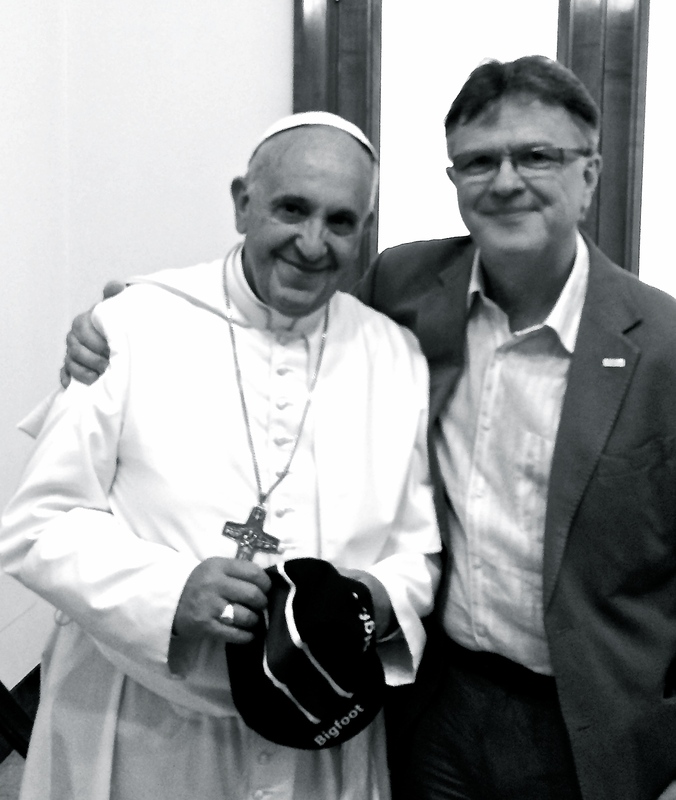 Saunders, who spent half an hour with Pope Francis earlier this year, is one of a number of abuse survivors from many different countries who will meet at the Commission’s next plenary session on 6-8 February. He described the appointment as a “tremendous recognition” for NAPAC, which he founded 18 years ago and is the only such helpline for adult survivors of abuse. For background on Saunders, see his interview with the Boston Globe last July. Saunders also appears in Austen Ivereigh’s new papal biography, The Great Reformer: Francis and the Making of a Radical Pope (Allen & Unwin). There he describes how Francis had listened closely to him as he told the Pope how the Church needed to invest more in helping and healing survivors. Saunders sees himself as a bridge between the Catholic Church he loves and the community of abuse survivors who are often deeply critical of the Church. The papal commission, whose president is Cardinal Sean O’Malley of Boston, and its secretary Mgr Robert Oliver, now includes two British members (the other is Baroness Sheila Hollins). The others members are: Fr Luis Manuel Ali Herrera (Colombia), Dr Catherine Bonnet (France), Marie Collins (Ireland), Dr Gabriel Dy-Liacco (Philippines), Bill Killgallon (New Zealand), Sr Kayla Gertrude Lesa (Zambia), Sr Hermenegild Makoro (South Africa), Kathleen McCormack (Australia), Dr Claudio Papale (Italy), Hon. Hanna Suchicka (Poland), Dr Krysten Winter-Green (US), Fr Humberto Miguel Yáñez (Argentina), and Fr Hans Zollner SJ (Germany). The Vatican’s bulletin announcing the new appointments gives the following information on the commission members. Cardinal Seán O’MALLEY, OFM Cap. (United States) is the Archbishop of Boston and serves as the President of the Commission and a member of the Council of Cardinals which advises His Holiness, Pope Francis. Mons. Robert OLIVER (United States) serves as the Secretary of the Commission, following many years in child protection work for the Archdiocese of Boston, the U.S. Conference of Catholic Bishops, and the Congregation for the Doctrine of the Faith as the Promoter of Justice. Rev. Luis Manuel ALI HERRERA (Colombia) is the Director of the Department of Phychology, professor of pastoral psychology in the Conciliar Seminary of the Archdiocese of Bogotá, and as a parish priest. Dr. Gabriel DY-LIACCO (Philippines) is an adult and adolescent psychotherapist and pastoral counselor for various mental health concerns including of individuals, couples, families and groups, including victims and perpetrators of abuse. Kathleen McCORMACK AM (Australia) is a social welfare worker who served as Director of Welfare of CatholicCare in the Diocese of Wollongong for 29 years and held leadership roles in Family Services, Child Protection, Out Of Home Care and Ageing and Disability Services. Rev. Dr. Humberto Miguel YÁÑEZ, SJ (Argentina) is Director of the Department of Moral Theology at the Pontifical Gregorian University, professor of moral theology at the Gregorian and the Pontifical Urban University, and former Director of the Center of Research and Social Action in Argentina. Rev. Dr. Hans ZOLLNER, SJ (Germany) is President of the Centre for Child Protection of the Pontifical Gregorian University and Director and Professor of the Institute of Psychology. He was Chair of the organizing committee for the Symposium “Towards Healing and Renewal” on sexual abuse of minors (February 2012).